Parks & Trails New York took over a parking spot in Albany for one day last month, converting it into a public campground complete with greenery, tent, camping chairs, camp stove and marshmallows. By creating a temporary refuge in the middle of the city, PTNY reminded New Yorkers how important it is to have a place to relax, rejuvenate and recreate. Throughout the City of Albany, parking spaces were temporarily transformed for a variety of public uses as part of PARK(ing) Day, an annual, worldwide event where artists, activists, and citizens independently, yet simultaneously, turn metered parking spots into “PARK(ing)” spaces—that is, temporary public parks and other space for people to enjoy. The mission of PARK(ing) Day is to call attention to the need for urban open space, to generate critical debate around how public areas are created and allocated, and to improve the quality of urban human habitat…at least until the meter runs out! In Albany, 10 parking spots were converted into public spaces. The event was cosponsored by Parks & Trails New York, the City of Albany’s Department of Development and Planning, and Capital District Transportation Committee’s Capital Coexist. Thanks to everyone who stopped by our spot, played some corn hole, ate roasted marshmallows, and let us know what you love to do in State Parks. See photos here and here, and watch this Time Warner Cable News story. The original PARK(ing) Day concept was developed by Rebar. 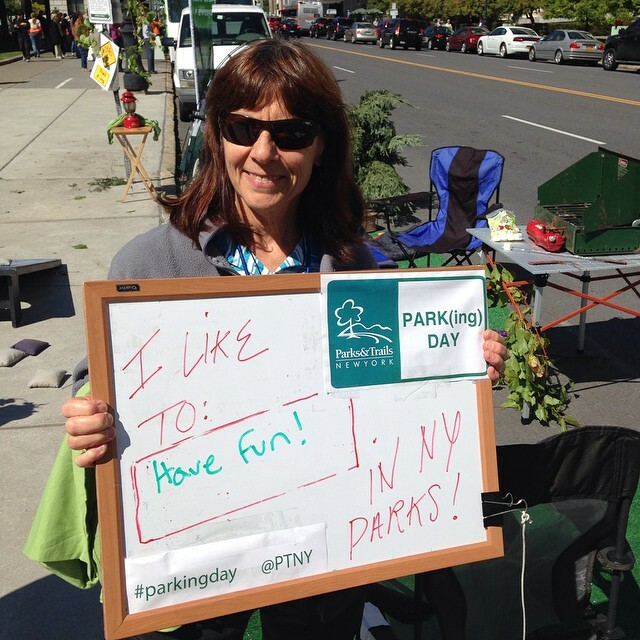 PARK(ing) Day 2014 – Join us in Albany!